"We can confirm that the presidential ballot paper has been printed and is complete," he said. "It was done at Fidelity Printers where political parties went and saw the printing process. Very soon the commission will, in terms of the law, publish the number of ballots that have been printed." He added: "We are also going to publish the printing company because the requirement in terms of the Electoral Law is that we must tell people the number of ballot papers that have been printed and the company that printed them. "Very soon the commission will put a public notice in that regard. The ZEC chairperson (Justice Priscilla Chigumba) will soon make a detailed communication on that." "The strict letter of the law is that we have the exclusive constitutional mandate to procure ballot paper, to design it, to print it and to distribute it," said Justice Chigumba on Monday. "The reason why we keep having these disputes around these areas is that the law does not provide that members of the public or stakeholders be involved in this process. Our law says only ZEC can do that. We respect the democratic right of each and every Zimbabwean to approach any fora that they feel will give them the relief that they seek." She added: "We will not be releasing pictures of voters to the public and this is because the right to access to information is not absolute. It must be juggled with the right to privacy. The format in which we have released the voters' roll, and the information that we have given on the voters' roll, is sufficient to fulfil our constitutional mandate, that we must provide a final voters' roll which is analysable and which is searchable. "We are aware of our constitutional duty to be transparent, to provide a final voters' roll which is analysable and searchable. It is our considered view that we have done so and that we have complied with the law without necessarily impinging on the rights of others. Rights are not absolute; they are subject to control in a democratic society." 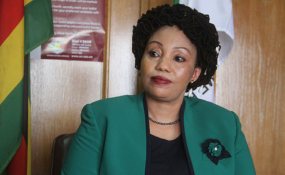 Reacting to demands by the opposition to release a voters' roll with pictures of registered voters, Justice Chigumba said; "Would you like your picture and your fingerprint, your name and your identification card number, your telephone, address number to be flighted around somewhere in the public arena? We have a duty to actually protect our registered voters from identity thefts and all sorts of things, we balance conflicting interests." The final voters' roll has 5 695 706 registered voters. Meanwhile ZEC has set up 10 985 polling stations throughout the country for the polls.